OH NO, IT’S THE DRAW! Yes, it’s 50% of the field for the Ready To Run Cup (9 of the 18 contenders) and 25% of those lining up for the Charity Mile, all of them graduates of our Ready To Run programme. While we know it’s otherwise, you’d swear there was a conspiracy against us; an analysis of the draws in the former will tell you that the top six Summerhill candidates in the betting are all bracketed from draws 9-14, without a break (in other words, 9,10,11,12,13,14!). “The one-eyed man is king in the land of the blind”, they say, so you may well accuse us of closing our eyes to the aspirations of the opposition, in which case, you’d probably be right!. You must remember, breeding horses is an emotional business, and if we can’t be sentimental about those we’ve nurtured here, we’d be better off counting notes in the local bank or standing behind an injection moulding machine in a plastics factory, so better we confess to an unashamed bias about this thing. In an attempt though, at bringing a modicum of objectivity to our thinking, the simple way is to use the handicappers’ ratings as the best guide, and so a scan of the top-ranked entries reveals Africa Rising, Visuality, Unagi, Safe Harbour (not ours), Double Appeal (also not ours), Comme-Ci-Comme-Ca, and The Thinker, in that order. This suggests that’s the way they should finish (given the even weights assigned for the contest), but to assume it will be so, you would have to ignore the draws. Which means we have to trawl the information highway for clues. While we can’t claim any intimacy in our information, the grapevine in Randjiesfontein tells us that draw or no draw, champion trainer Sean Tarry looks to have a dab hand. We should quickly note that his “fist” includes one of the higher-rated horses, Safe Harbour, who could be a threat against the prospect of Summerhill registering its eighth winner from ten renewals of the Ready To Run Cup. 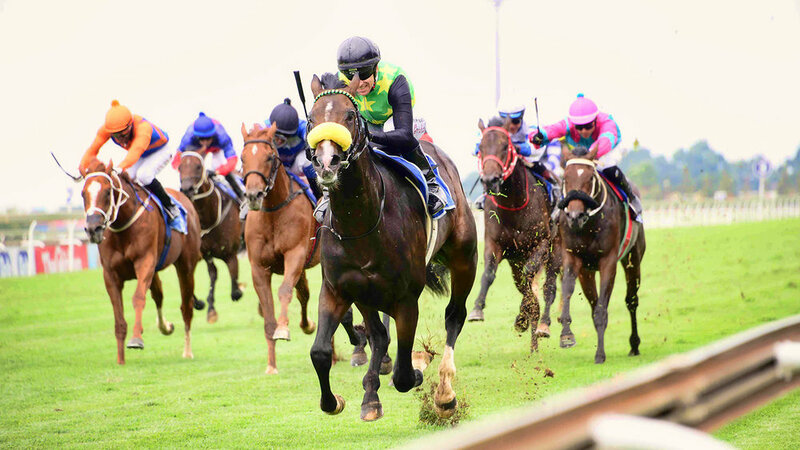 This past weekend, newly-licensed trainer, Gareth Van Zyl, registered not only his first winner from his first runner, but also his first Stakes winner for his “master”, Buffalo Bill Burnard. An sms response to our congratulatory text earlier in the week confirmed Gareth’s faith in the old warrior, No Worries, who, exceptionally for us this weekend, is drawn at No.3 for the Charity Mile. Thereafter, like our runners in the Cup, the rest go “west”, with Champagne Haze at 10 among an outstanding trio including Brett Crawford’s Rabada (draw 17), the only colt of his generation with a Group One victory on his C.V. at both two and three, and Sean Tarry’s dual Group One-performing filly Intergalactic (13). It’s a tall order for Rabada, who’s been off since the KZN Breeders Mile back in June, (when he succumbed to a devastating closing rally from No Worries, under a weight disadvantage now addressed to some degree), and Intergalactic who, according to Tarry, would be in with an obvious shout if it weren’t for her barrier position. That said, this is a loaded field from a talent perspective, with all of Mac De Lago, Saratoga Dancer, New Predator, Deo Juvente and St Tropez enjoying favourable spots, without discounting the claims of “July” ace, The Congolmerate (15), Mogok Master (10), and Ten Gun Salute (12). Whatever they look like a furlong or two from the start, and however that influences the outcome, we’re in for a helluva day’s racing. Our seatbelts are tight.